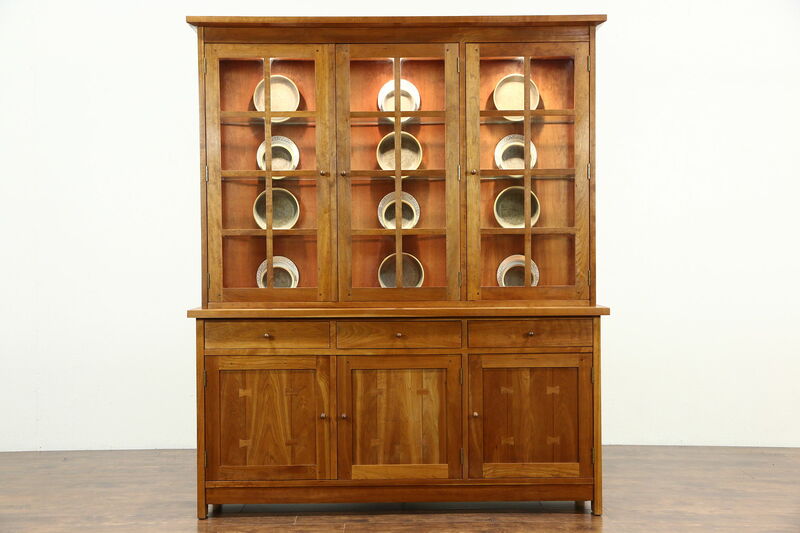 A solid cherry china display cabinet, breakfront or hutch from 1995 is signed by famous maker, "Stickley of Manlius, NY." Entirely original, the hand rubbed finish is in extremely fine condition on this American made top quality vintage furniture. Authentic "butterfly" joints and round wooden pegs connect the wide planks of richly figured solid cherry. The glass upper section is lighted and has adjustable plate glass shelves with grooves to display plates. Drawers have solid cherry sides with dovetailed joints. The upper cabinet is a separate piece for easier moving. Measurements are 68 1/2" wide, 18" deep, 82" tall and the base is 34" high.